A fourth and final type of efficiency-wage theory emphasizes the link between wages and worker effort. In many jobs, workers have some discretion over how hard to work. As a result, firms monitor the efforts of their workers, and workers caught shirking their responsibilities are fired. But not all shirkers, are .caught. immediately because monitoring workers is costly and imperfect. A firm can respond to this problem by paying wages above the equilibrium level. take workers more eager to keep their jobs and thereby, give workers an incentive Ward their best effort. 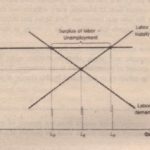 This particular type of efficiency-wage theory is similar to the old Marxist idea of the “reserve army of me..unemployed.” Marx thought that employers benefited from unemployment because the threat of unemployment helped to discipline those workers who had jobs. In the worker-effort variant of efficiency wage theory, unemployment fills a similar role. If the wage were at the level that balanced supply and demand, workers would have less reason to work hard because if they were fired, they could quickly find new jobs at the same wage. Therefore, firms raise wages above the equilibrium level, causing unemployment and providing an incentive for workers not shirk responsibilities.